The defender believes Limerick can go all the way following a second stunning victory over Tipp in two years. 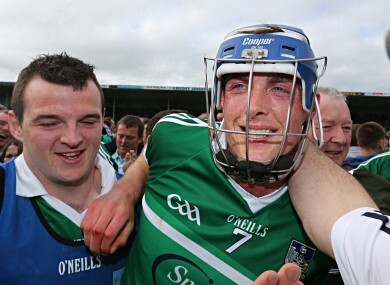 Limerick's Gavin O'Mahony is congratulated by supporters on the pitch after Sunday's game. LIMERICK DEFENDER GAVIN O’MAHONY insists his team’s only goal ahead of championship summer was to defeat Tipperary. Now that that has been achieved, in thrilling fashion at Semple Stadium, thoughts of retaining the Munster hurling crown has come into focus. O’Mahony and his Limerick teammates rallied in the closing minutes to turn a three-point deficit into a two-point win. He was ‘very aware’ that no Limerick team had beaten the Premier County at Semple for 41 years. O’Mahony, “We’d no other goal at the start of the year other than Tipperary in the semi-final. When you put as much pressure as that on yourself going into a match, it’s unbelievable when it comes off. It’s hard to fathom really. There was no shortage of motivation for Limerick to prove their credentials against Tipp for the second year running, he declared. Any paper you’d pick up, any person you’d meet on the street, it was an easy Tipp win. We didn’t want for motivation. You just have to buy in to your own camp, listen to your own camp and have a small bit of belief. Email “O'Mahony: 'We'd no other goal at the start of the year other than beating Tipperary'”. Feedback on “O'Mahony: 'We'd no other goal at the start of the year other than beating Tipperary'”.